Size: 6 in. x 9 in. 312 pp. For over three hundred years after their mysterious community vanished, legends of wizardry and supernatural events have circulated among local people. Even today, people gather at the site of the so-called Hermit’s Cave in a remote part of Philadelphia’s Fairmount Park to celebrate what participants believe were part of the community’s secret traditions. The community lived without sect or name. 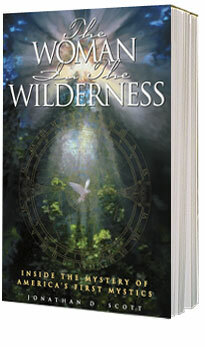 They were most often called The Woman in the Wilderness, in reference to an obscure passage in the Book of Revelation. Brought to vivid life as historical fiction, this is the true story of the origins and fate of the first mystical community in America and its brilliant young leader, Johannes Kelpius. The story follows the quest of Lydia, a German-American woman who finds herself in possession of objects she is told had once belonged to Kelpius. Together with the reader, Lydia discovers the truth about The Woman in the Wilderness—a truth as strange and intriguing as the legends themselves. "Tells of the pain of the voyage through this life's wilderness and the never-ceasing desire to find meaning"